It is now week 3 (see week 2 here) of the "Can me relaxed hair be healthy?" series and the weeks are just moving right along! The weeks when my hair is still very straight seem to fly by but I know once I hit double digit numbers, the weeks will get slower and slower (at least in my mind). This week for the relaxer stretching series I did a roller set again. As much as I do not like sitting under the hooded hair dryer, I am sort of secretly liking roller sets because I can have all of the benefits of wearing my hair straight without having to put direct heat from a blow dryer or flat iron on it. Plus I love the fact that my relaxed hair is not just flat and looking like it's stuck to my head like freshly relaxed hair has a tendency to do. In The Healthy Relaxed Hair Journal, I give my professional recommendation of styles to get each week while you are stretching your relaxer. Then rolled my hair up using a combination of red and purple rollers (mostly red). I sat under the dryer for about an hour and a half before my hair was dry. At that point, I wrapped it and got back under the dryer before unwrapping it again. Some of the nights I rolled it up in order to keep a few curls, and the rest of the week I wrapped it up. If you do a roller set and want to keep it looking curly you definitely want to roll it up. If you like less curl, you will need to wrap it up at night. Wrap your hair nightly to maintain it. Roll it if you want it to stay more curly. Check out the video to see exactly what I did this week. Be sure to subscribe to my channel while watching! 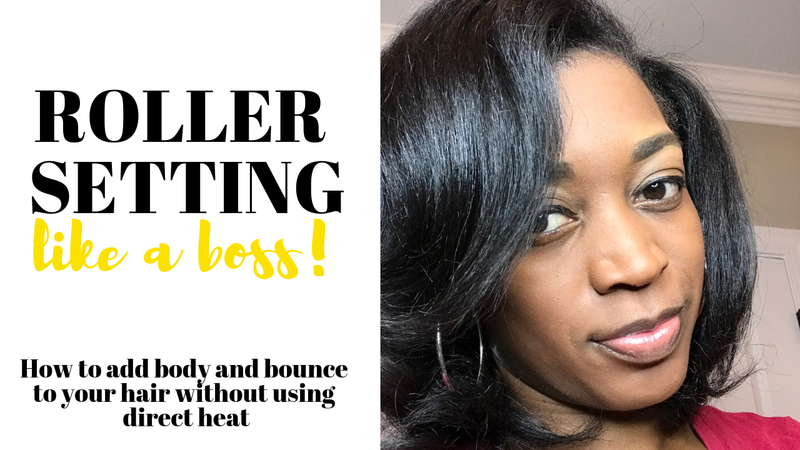 If you would like to know exactly how I did my roller set, click here to take the course. Take my roller setting class here.